Project 1590 has had tremendous support from our community! Local businesses and community members have been very genourous in keeping this project alive. Thank you to all who have helped support in any way. Project 1590 is still in need of financial donations as well as volunteers, if you are interested in helping project 1590 or a specific project, please contact us! We take personal donations as well! 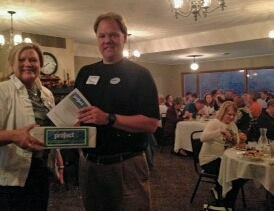 Steve Hawkins and Ruth Cyphers presenting at a Chamber Bureau 14 meeting.